CEM’s are authorized by the state to oversee the environmental assessment and clean up of hazardous waste as well as manage the conduct of such work, etc. UTH’s are authorized by the state to repair, upgrade or close Underground Storage Tank’s. In fact, RDO employs two professionals who are both CEM’s and UTH’s . (There are only six individuals certified by the State of Nevada who are both CEM’s and UTH’s.) In the last 30 years, RDO Environmental has been actively involved in the removal of well over one-thousand (1,000) underground storage tanks. Federally mandated Hazardous Materials and Site Investigation training. 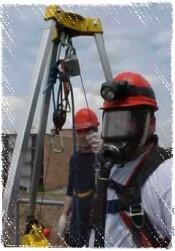 Which includes training in personal protective equipment (PPE) and respiratory protection. RDO drivers are recognized for safety excellence. We have the capacity to serve large-volume bulk liquid waste-streams, as well as small-quantity, less-than-truck-load waste generators. Our extensive equipment fleet is regularly cleaned and inspected in accordance with Department of Transportation and Environmental Protection Agency regulations. The above underscores the level of knowledge, training and commitment of RDO personnel.